A trip between Paris and Istanbul on the Orient Express was the height of luxurious rail travel for Victorian tourists and it’s only right that this experience is now the theme of an online slot machine from Yggdrasil Gaming; players travel through four locations with four free spins modes on the way. Orient Express is a five reel slot with three rows and twenty fixed paylines; we view the action from inside a well-appointed railway carriage and the symbols spin on transparent reels set against the window as various landmarks and landscapes scroll past. The four high value symbols are all well-heeled travellers on this train while the lower values are represented by four playing card symbols of various colours. When you start playing the game you’ll always be in Paris but each time the free spins is triggered you’ll move on to Venice, Belgrade and finally Istanbul. Each location has an extra feature in the base game and the free spins as described below. 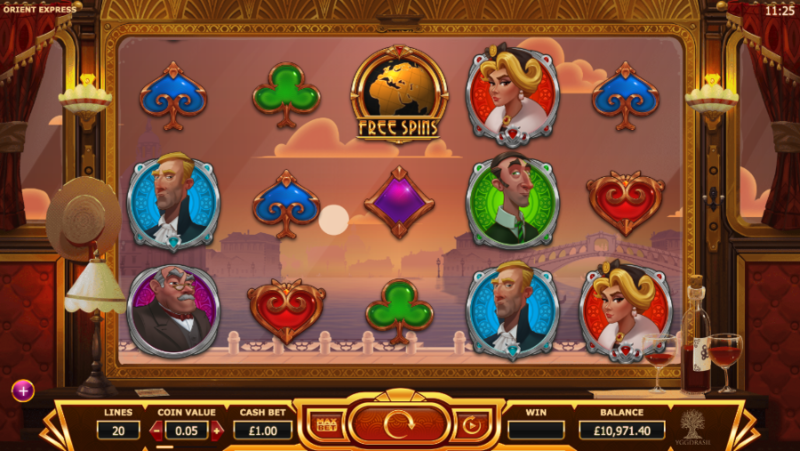 The spins are triggered by landing three, four or five of the Free Spins scatter symbols for which you will receive seven, fifteen or thirty free spins respectively. Paris Spins/Base Game – the conductor wild may appear after the reels have stopped and he will move to the left and award an extra free spins on each spin until he hits the left hand side. He appears more frequently in the free spins. Venice Spins/Base Game – a multiplier wheel will award up to 5x for all wins in the free spins and some wins in the base game. Belgrade Spins/Base Game – one to three wild reels can be created (by a small train) on each free spin and on some base game spins. 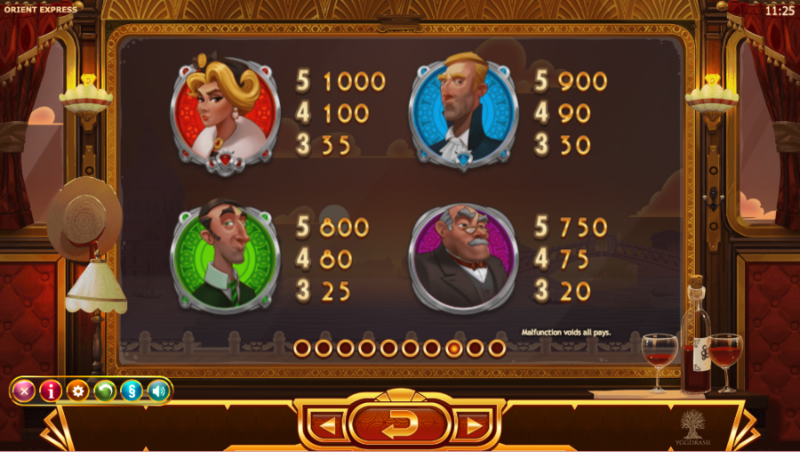 Istanbul Spins/Base Game – up to 12 reel positions are turned wild (by flying postcards) on each free spins and on random base game spins. After you’ve reached Istanbul you are then able to select your next destination when the spins are triggered.